My grandparents, Guy Hayler and Ann Elizabeth Harriss were married at St. Marks Church, Kennington on July 29th, 1874. If any photographs were taken, sadly none have survived, but I have in my possesion my grandmother's wedding dress and an attractive inlaid wooden box inscribed inside: To Lizzie Hayler from J. Oliver 29th July, 1874, surely one of their first presents for their new home. Guy Hayler was born on 5th November, 1850 - hence the name Guy - in the little town of Battle in Sussex. The cottage next to the gateway of Battle Abbey is still standing. He came from humble parents – his father being a tailor very politically minded and involved in the Chartist Movement. When he was six years old young Guy was persuaded to sign the pledge on the anvil at Mr. Noakes blacksmith shop in Hastings. This was to be the start of a life long devoted to the cause of Temperance. His parents both died before he was out of his teens, and at fourteen with very little education he left Battle to seek his fortune. Two or three years later, after many false starts in various towns he arrived in London. Somebody handed him a handbill advertising a meeting to be held in the Exeter Hall, 26 King William Street. This proved to be a great temperance rally and my grandfather became immersed in the cause. He was given the role of steward and attended all the public meetings. 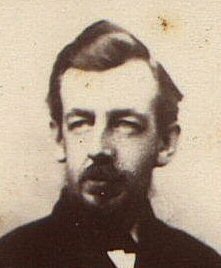 In 1870 when he was twenty, he joined another branch of the movement called the Good Templers, an organisation that had Lodges in different parts of the country. This particular lodge was over William Tweedies bookshop in the Strand and it was here that he had the good fortune to meet my grandmother Elizabeth Harriss. At this stage my grandfather had found work as a painter and decorator. My gradmother came from a much more affluent background. Her mother Sarah Harriss was the daughter of a master potter of Lambeth and an associate of Sir Henry Dalton the great potter of South London. Her mother's brother Henry Chambers was a Justice of the Peace a well known public man and a leading brick and tile maker in London. My grandmothers father was an official in the Woolwich Dockyard and fell victim in 1849 to the great cholera plague which ravaged the country. However the family seemed to be well provided for, possibly by Uncle Henry, who left a small fortune when he died. My grandparents marriage proved to be a very happy one, lasting 67 years and producing a large family neatly divided into four boys and four girls. My father Glen being the youngest boy and next to youngest child. 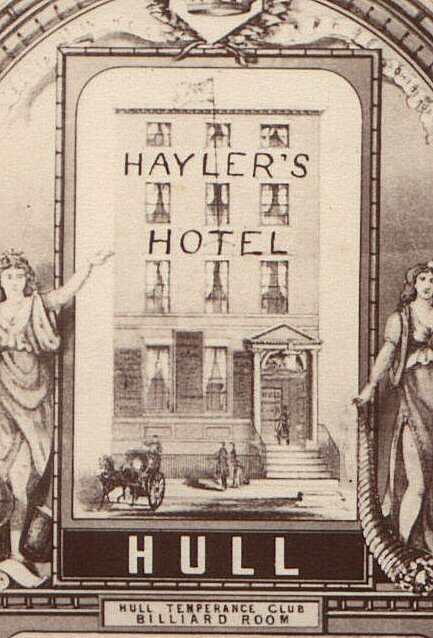 In the year of their marriage they moved to Hull where they ran - Haylers Temperance Hotel. On the advertising card I have describing it, there are engravings of the coffee rooms, billiard room, smoke room, commercial room, club room and reading room. It looks quite an impressive place. My grandfather was also busy at this time organising public meetings and getting involved in all aspects of the Temperance movement. 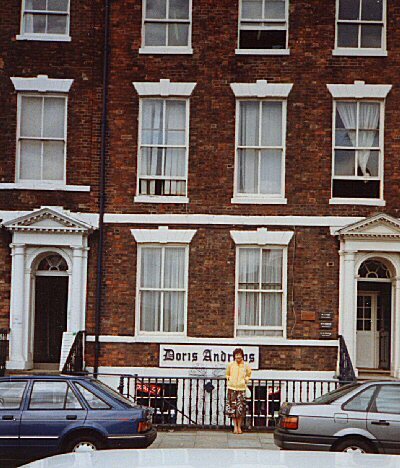 After sixteen years they left hull for Newcastle, where my grandfather became full time secretary of the North of England Temperance League. He worked incredibly hard here organising hundreds of rallies, demonstrations and public meetings. One of the most successful events was a grand bazaar opened by Queen Victoria's daughter, Princess Louise. He was now becoming well known as a powerful orator. It was at this stage that his great friendship with Rosalind, Countess of Carlisle began. Family legend has it that one hot summer evening about 1890, my grandfather was speaking at a meeting in York, very close to the railway station. The windows were open and his voice travelled clearly. Sitting on the platform waiting for her train was Lady Carlisle. She was so impressed by what she heard she forgot about her train and went into the meeting. From then on she and my grandfather became great comrades in the Temperance cause. She obviously admired him immensely. I have a silver rose bowl inscribed - to Guy Hayler from Rosalind, Countess of Carlisle, in memory of our work for the League 1894 - and a beautiful silver teapot inscribed - To Guy Hayler from his Temperance colleague Lady Carlisle 1904. Many stories have been written about Lady Carlisle, perhaps the most popular one being that she had the contents of the wine cellar of Castle Howard emptied into the lake and that many plants and fishes died. I believe this has been disputed, although my father always vowed it was true. About 1906 my grandfather had what appeared to be a nervous breakdown through over work and could no longer carry on the burden of his activities in Newcastle. His doctor told him he must have a complete rest – a very difficult task for a man with such a large family. However Lady Carlisle came to the rescue. She said she had two cottages in the village of Bulmer which could easily be converted into one large house to accommodate the family. She also proposed to make my grandfather an allowance so that he could carry on the work of the cause at his leisure, speaking at village meetings. As recently as May 1986 my uncle Mark (in his 99th year) told me that he could remember the excitement of seeing the builders and decorators in the house and Lady Carlisle driving over from Castle Howard in her carriage to make sure the work was being done correctly. So began the association of the Hayler family with Bulmer. They were to stay there for only two years but memories of the village remained with them for the rest of their lives. Lady Carlisle's kindness didn't stop with the house. Mark became a secretary to Lord Carlisle at Naworth Castle and work was found for my father in the gardens and glass houses at Castle Howard. On settling into Bulmer my grandfather's first priority was to buy a pony and trap at the nearest market of Nalton. My Aunt Hilda has written a delightful account of the buying of Tommy. 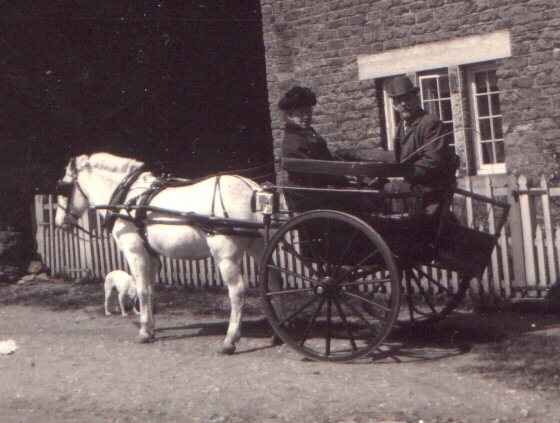 My grandfather had never driven a pony and trap before and my grandmother was too nervous to drive home with him, preferring to ride in the trap of their neighbour at Bulmer. Hilda said she ran to open the gate when she saw her father coming up the hill, looking so proud of his lovely white pony with the black and silver bridle. All the family helped to settle Tommy in the stables and made a great fuss of him. The next morning they were all up early to see their father get him harnessed. As my grandfather had had no experience the whole thing was complete fiasco, with Tommy turing quickly and knocking grandfather down. The family rushed to get the man opposite to do the job and by the evening it was all round Bulmer – everyone thinking it a great joke. Hilda said that when the pony was in their field the children of Bulmer had rides on his back and he was a great favourite. Soon my grandfather was driving all round the area speaking at village meetings and forcing Tommy past the Inns where evidently his former owner used to stop! 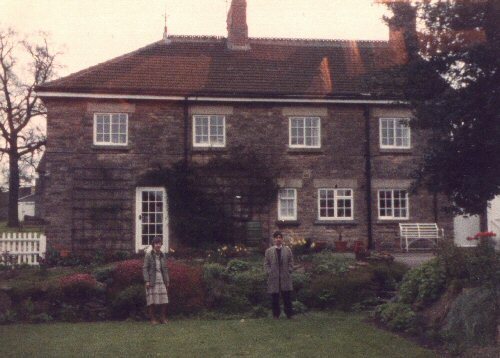 My father's memories of Bulmer were mainly centred on the cold winters. He often told us of the deep snow and how for many weeks in the winter the village would be completely cut off. One morning he looked out of his window which looked towards a single storied house (I believe it is still there). He said all he could see was the chimney pot with the smoke coming out. All the family turned out to dig a path to rescue the old lady who lived there. He remembered vividly getting up on dark snowy mornings to walk to Castle Howard. He had to be there by six o'clock, and to get there had to go across a ploughed field and go through a wood. He remembers the pain of his freezing hands and feet. The House at Bulmer ca. 1986. Shirley Hare and Christopher Hare. The family took an active interest in village life as my father's diary for 1909 proves. Feb 3rd - Bulmer Reading Room reopens after cleaning and decorating. Large gathering. Feb 22nd - Went to Bulmer Band of Hope concert. A very poor affair it was! And so on throughout the year with many records of visits to meetings and social gatherings. His brother Mark was, at this stage, thinking of becoming a Congregational minister and there are many references to him preaching in the village and the district. About the end of 1908 things took a dramatic turn. Wealthy Uncle Henry died leaving a great deal of money. My father told me he could remember the excitement of the family gathering in the kitchen at Bulmer to hear his father read a copy of the will to them. My grandmother had been left a considerable sum enabling my grandfather to have the independence he craved for. His heart was now set on London, and by 16th July 1909 my father recorded in his diary that his father had secured “Courtfield” a large Victorian house at South Norward for the family. On 22nd August Mark preached in Bulmer for the last time. Obviously they were busy packing at home as on Wednesday 25th August my father moved up village to stay with Mrs Booth the village school teacher. Aug 30th - Leave Castle Howard. Given a basket of fruit from the gardeners. Gave present to them. Sept 1st - Left Bulmer for good to live at South Norwood, London. 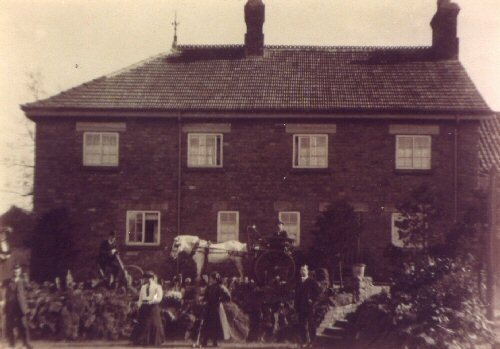 And so the family left the house so generously provided for them by Lady Carlisle, but packed away with the furniture were photographs they took when they moved in in 1907 and the large mounted professional one taken in May 1909 when they knew they were to leave – taken by Thomas Thompson of the Post Office Welburn. I found three copies of this photo when I helped to clear the family home in 1981. when my cousin Joan visited us in 1983 she took one of the photos back with her to California. Her father Wilfred was the eldest boy who went out to America in 1911 and never returned to this country, but he often spoke to her of the village in Yorkshire where they all lived. My grandfather, his health miraculously restored, threw himself into public life in London, enjoying every minute of it. He spoke at public meetings, wrote books, pamphlets, stood for parliament and became quite a public figure of his day. The crowning moment came in 1930 when he had his portrait in oils presented to him by the then Chancellor of the Exchequer, Philip Snowdon, at a grand ceremony at Caxton Hall Westminster. The family went their many ways, each of which would make a good story – but they were probably never so united as when they were all together at the old house at Bulmer. It was a great thrill for me in May 1986, just three weeks after my father died at the age of 97, to stand with my elder son Christopher, in the garden where my father and his family had posed so proudly for their photograph in 1909.